Travel your way, with the fully customizable TravelTab Navigator Plus. Our multi-functional travel tablet with voice-activated navigation and multi-language support helps you find your destination with ease, while the onboard apps entertain and keep you in touch with those that matter the most. Navigator Plus is the ideal travel companion for business trips, conventions, trade-shows and of course, a little sightseeing. Our robust, voice-activated, software comes with multi-language support, turn-by-turn navigation, and up-to-date traffic information. TravelTab gets you to your destination using the most efficient and safe routes for travel. Indulge in the world’s leading apps. The Navigator Plus keeps you, your travel companions, or your little ones amused with built-in games, news, social media apps, language translation, currency conversion, and other convenient travel tools. Score exclusive deals on local attractions, events, dining, and shopping. Browse your area for the best discount offers and enjoy your destination all while saving money! Choose to upgrade your Navigator Plus by activating the Secure Wi-Fi Hotspot. In the click of a few buttons you’ll be ready to enjoy lightning fast 4G LTE connectivity while surfing the web wherever you are. You can choose how many connections you need, and how long you need them! Connect just yourself today, and upgrade to connect your friends, family, or colleagues tomorrow. 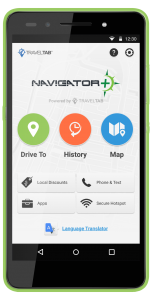 Choose to upgrade your Navigator Plus by activating the TravelTab Phone. With affordable credits that beat most competitors, you’ll save money and get more time to talk or text the most important people in your world! You can choose the amount of credits you need right away and purchase more anytime you need them! It’s that easy. The TravelTab Phone allows you to call and text any country in the world without roaming fees! Stay in control of your spending and never return home to an expensive cellular bill again. With affordable credits for domestic or international calls, the TravelTab will keep you in touch with those that matter most. We’re here 24/7. Call us at 877-938-7216 (US, Canada, & Mexico).